Thomas Speak(e) is 10 generations upstream from me, or my 8 times great-grandfather. He is also the original immigrant in the Speak family, the one who braved the icy waters of the Atlantic to reach out for a better land, and apparently, religious tolerance, if not opportunity, in colonial Maryland. My connection to Thomas works like this. Thomas Speak born circa 1630 in Lancashire, England and died August 6, 1681 St. Mary’s County, Maryland, married Elizabeth Bowling before November 3, 1663 when she was subpoenaed to court to testify. Ollie Bolton and William George Estes were my grandparents. Thomas was the first Speak ancestor to set foot on American soil. That was while we were still a British colony. I was lucky enough to visit St. Mary’s County, Maryland in 2011 where the original Speak family settled and lived for several generations. The annual Speak(e)(s) Family convention was held in St. Mary’s County, and through the generous research of several family members, original Speakes land was identified and much of our early history was pieced together. I wrote an article about the visit for the SFA newsletter, which I’ve adapted for this article. This research was only possible due to the collaboration of several people. The early Maryland research was completed by John Morris and published in the SFA Newsletters at various times, the land records, research and maps of Bowling Speak(e)(s) land by Jerry Draney, the history of St. Ignatius church from their website, and most of the photography by me during my visit in October of 2011 with the Speaks Family Association. The photo above is from the St. Ignatius church website at http://www.chapelpoint.org/history.asp. Our first ancestor to come to the land that would one day become America, Thomas Speak was already in Maryland and had married Elizabeth Bowling before 1664. The first record in Maryland that can be directly attributed to our Thomas referred to as Thomas of St. Mary’s, not to be confused with Colonel Thomas Speak who started out in Maryland and wound up, a wealthy man, in Virginia, was his land grant of 50 acres in 1670 “for service”. John Morris in his 1998 article about the life and times of both Thomas Speak states that there is ample evidence of Thomas of St. Mary’s in Maryland before 1661. In January of 1661 a summons was issued to the sheriff in Charles County Maryland for a Thomas Speake to testify on behalf of the government about a crime. Col. Thomas Speake had been dead for 18 months and his son Thomas, who died without issue, was not yet 21, so the Thomas being summoned had to be, by process of elimination, our Thomas of St. Mary’s. On November 3, 1663, Elizabeth Bowling Speak was also mentioned in a court record, having been subpoenaed to testify. In 1662/63 Thomas Speake filed a lawsuit against Arthur Turner in Charles County to collect debt and he described himself as a tailor and signed with his mark “TS”. Our Thomas did not know how to write. John Morris, a lawyer by trade, states that this record shows that Thomas Speake was not indentured at the time this was filed, because if he had been, the claim would have belonged to his master. However, we know he had been indentured, because he received 50 acres in 1670 for his “service.” If his indenture was the traditional 5 or 7 years, this pushes his arrival date back to between 1655 and 1657. John suggests that he was probably a young man, between the ages of 15 and 20 when he arrived, pushing his birth back to about 1630 or so. The oldest son of Thomas Speake and Elizabeth Bowling was their son John (whom we call John the innkeeper) who testified at a later date that he had been born “about 1665” in St. Mary’s County. Charles County was originally part of St. Mary’s County and is adjacent today. In 1670, Thomas received his land grant after having served his time as an indentured servant to pay for his passage to Maryland. Indentured servants were not allowed to marry. Typically, but not always, indentures were for 7 years. If this is the case, and he married Elizabeth Bowling in 1663, he would have been indentured by 1656 or perhaps, if only indentured for 5 years, as late as 1658. If he married earlier, then he would have been indentured earlier as well. He would have entered the country at the time of his indenture. He would probably have been between 18 and 30, so probably born between 1626 and 1638. 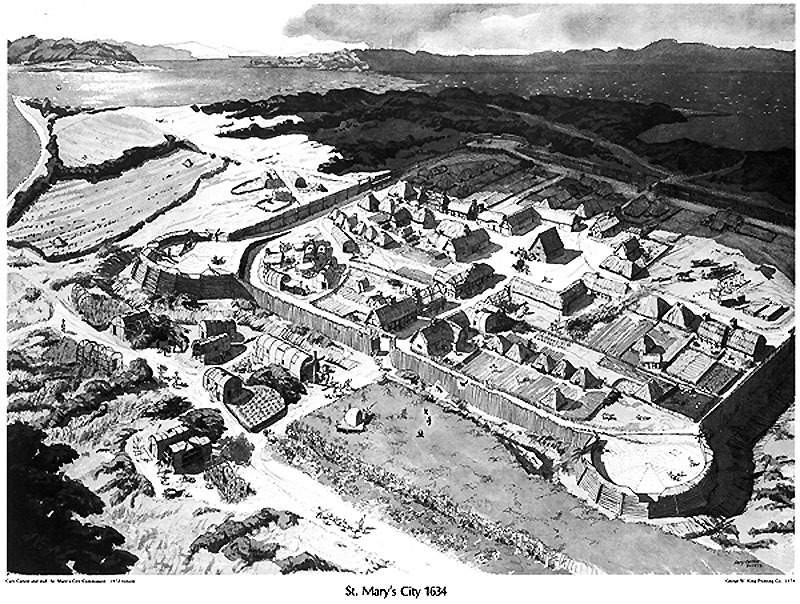 Although things would have changed between 1634 and 1655 or so when Thomas arrived, this drawing of St. Mary’s City in 1634 from the Maryland State archives map collection gives us some idea of what Thomas might have seen upon arrival. Note the Piscataway Indian village located just outside the fort on the left. As we now know, the Speak family had some sort of relationship with the Indian tribe as they lived on the land owned by Bowling and subsequently, his son Thomas (of Zachia) and his son, Charles Beckworth Speak. Today, archaeological excavations continue at the site of the Indian village on historical Speak family land. Thomas is believed to have been born about 1634. He died in 1681 with a will that tells us a great deal about him, in particular that Thomas of St. Mary’s was a Catholic. … I give unto my Loving Son John Speake all my Lands after the Decease of my Loving wife Eliz. but in Case she my said wife shall marry then she two Enjoy only her third according to law my will is also that my Loving brother in Law James Bowling [Bouring, Bowing] hath the Disposall of my children to be brought up in the Roman Catholick faith And … that my body may be decent lead. At the discretion of my loving brother James Bowling [Bouring, Bowing] my above said Exec.. And I do hereby revoke disannul and make void all former wills and Testaments by me heretofore made in witness whereof fire the said Thomas Speake to this my last Will and Testaments have set to my hand and seal this 6th of May 1681. My meaning is to give…… Speake my loving Son all my lands to him and his heirs for Ever and to my personall Estate to be Equally Divided my wife first having… third… Rest amongst mind Children. Not only was Thomas a Catholic, but he was a practicing Catholic and his religion was obviously very important to him. This will also tells us that Thomas’s land, although never located, was probably in Port Tobacco, because that is where we find John Speake, known as John the Innkeeper, living, later. Bowling Speake, however, not being the eldest son, was on his own in terms of finding and acquiring land after he reached adulthood. In England, Catholics were forbidden to practice their faith. They couldn’t hold office, and many unbearable restrictions were put upon them. In the late 1620’s, the Calvert family provided a plan for the colonization of Maryland; a new colony in the new world with freedom of religion possible for all. In November of 1633, the expedition set sail for America in two ships, the Ark and the Dove, with Fr. White among the colonists along with two other Jesuits, Fr. John Altham and Brother Thomas Gervase. The two ships arrived at St. Clement’s Island in March 1634. Fr. White celebrated the first Mass in Maryland and set about establishing the Church in this new land. Catholic settlers began to move westward along the Potomac River. Fr. White established a claim for St. Thomas Manor lands and took up his residence. A chapel had been erected at the point of land now known as Chapel Point. Fr. 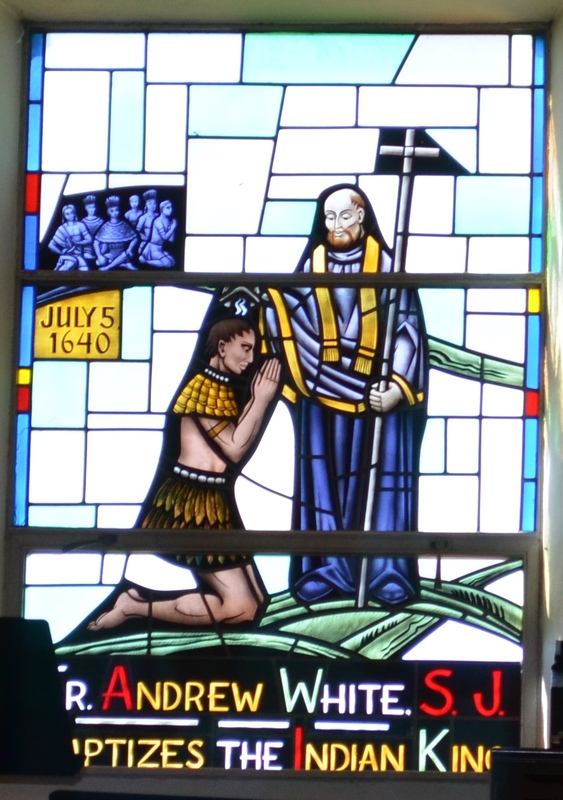 White labored among the Indians, broke the language barrier, and wrote a catechism in their language. The window above the entrance (and shown above) of the Church commemorates the baptism of the Indian King and Queen of the Piscataways. Fr. White also blessed their marriage, and baptized their child. St. Ignatius Church at Chapel Point was founded in 1641 by Father Andrew White, a prominent English Jesuit, who was born in London in 1579 and who was one of the first Jesuits to arrive in Maryland. Father John G. Shea, S.J., an authority on U.S. Catholic history, tells of a remarkable miracle wrought through the large relic of the True Cross (shown below) which Father White carried in a specially designed receptacle hung around his neck. Fr. White was called to attend an Indian who had been impaled by the limb of a tree. The branch had gone through the upper part of his body and he was in great agony and near death. Fr. White was able to impart the necessary articles of faith, which the Indian accepted, and then baptized him and administered the last Sacraments. Leaving instructions that, upon death, the body was to be kept for burial with the Church’s ritual, he blessed the Indian with the relic of the True Cross, and departed. The next day, Fr. White returned to bury the Indian and was astonished to find the Indian recovered and out fishing. Two small marks were all that was left of the wounds. The same relic of the True Cross which Fr. White brought to America remains at the Church. 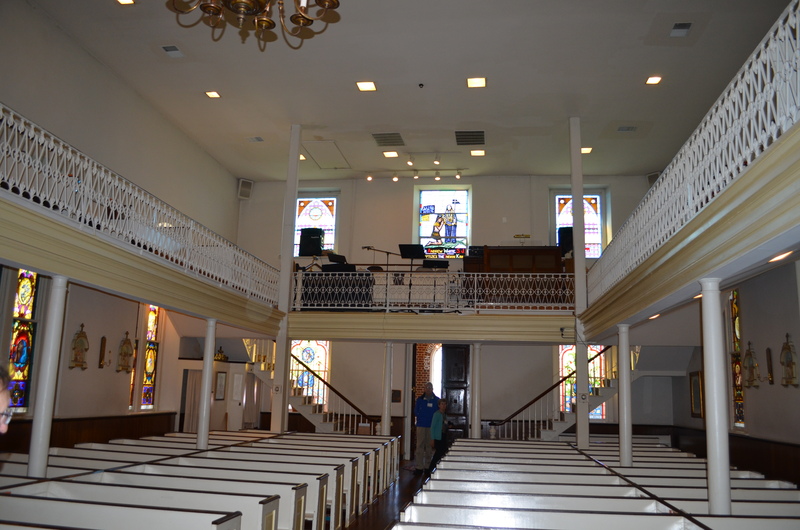 The present Church was built in 1798 by Fr. Charles Sewall, S.J., and is dedicated to God and to St. Ignatius Loyola. The bricks of the Church, house, and chapel are laid in an attractive Flemish Bond, with a header in between each of the two stretches which was a style most popular in colonial days. On December 27, 1866, a disastrous fire occurred, destroying the interior of the Church, chapel, and Manor. Irreplaceable losses at this time were the Church records and other historic documents. The baptism book begun in 1862 was saved. The walls stood firmly and the interiors were restored in 1867-68. Some Church furnishings saved during the fire include the Church doors, a carved wooden crucifix, and the tabernacle. Former slaves are said to have carried the tabernacle from the burning Church. The old wooden tabernacle is of mahogany from Santo Domingo and the sewing within it was done by the Carmelites before 1830. 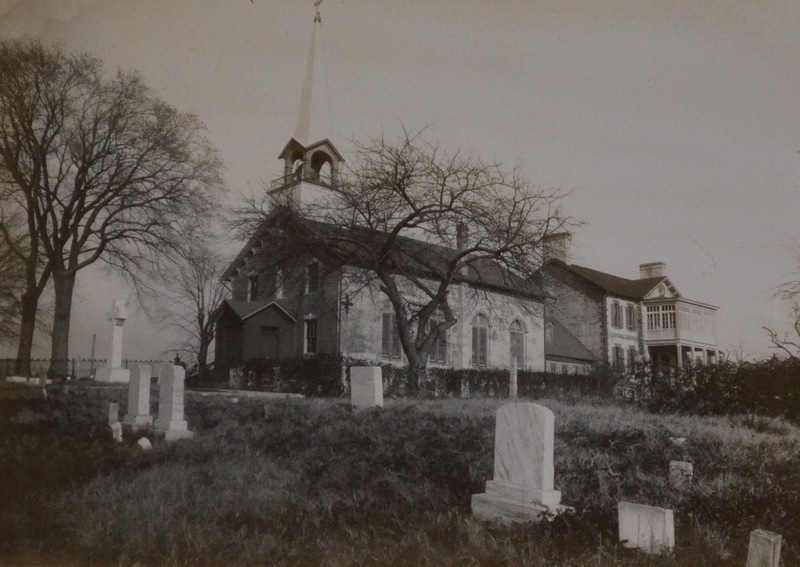 The photo below is the church and behind the church, the priest’s quarters in 1933, from a photo hanging in the priest’s home today. Below, the church today across the cemetery. Aside from the historical and religious significance of this church, it is also provides one of the most beautiful vistas of the Port Tobacco River to be found. 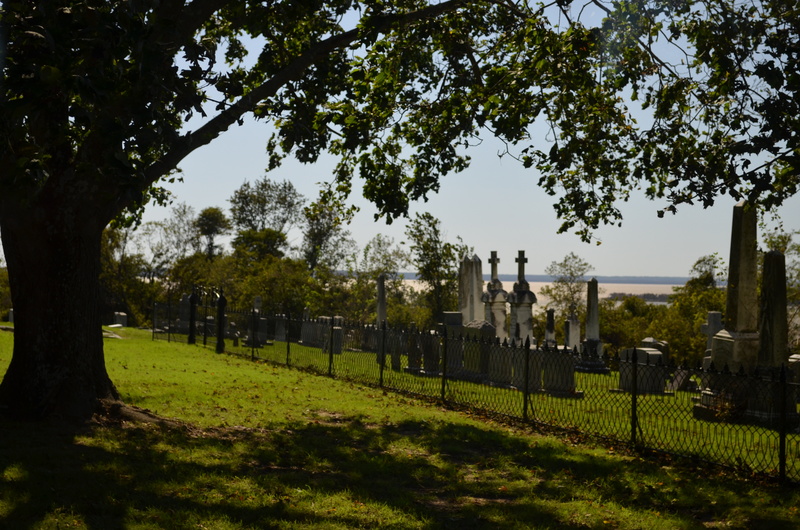 From in front of the church looking across the cemetery, you look down over the river. A simply stunning and inspiring vista on a warm and windy fall day in October of 2011. Given that Thomas Speak had to have been here before 1660, and the first and only Catholic church at that time was St. Ignatius, that had to be the church that Thomas attended. His children were Catholic was well, Bowling, his son, at one time being fined as such, and they were surely baptized there. 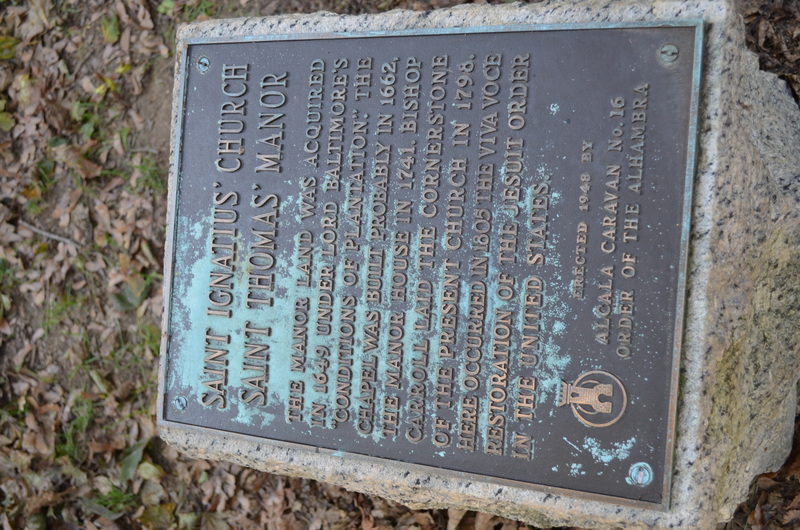 Thomas is most likely buried on his farm, which has not been located, but there is also a possibility that he is buried in the churchyard at St. Ignatius. Whether he was buried here or not, he most assuredly attended here and stood on this land and of a more personal nature, touched and saw the “relic of the true cross” and took communion from this very chalice, complete with its bumps, bruises and dings from its life being carried in a saddle bag by the priests in their travels. Thomas may have been one of the settlers who hosted Mass in his home. 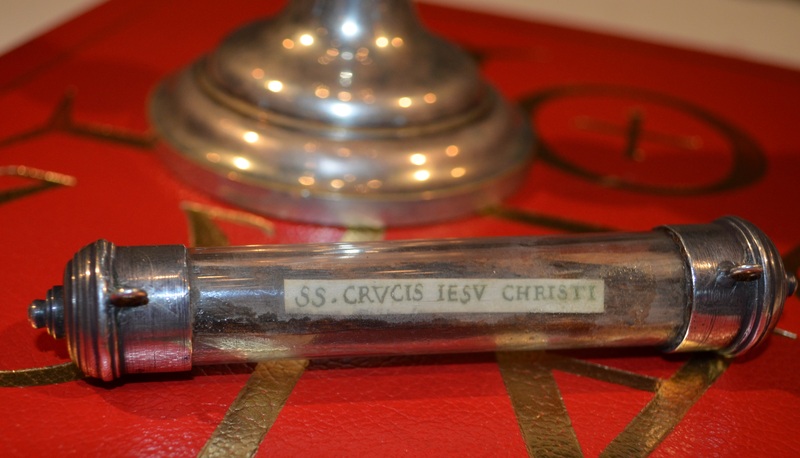 The “relic of the true cross” was brought from England by Fr. Andrew White, S.J. in 1634. He wore it around his neck in a silver and glass case, which was specially made for the relic. This piece of wood was brought back from the Holy Land during the crusades and is supposed to be a piece of the cross upon which Jesus was crucified. 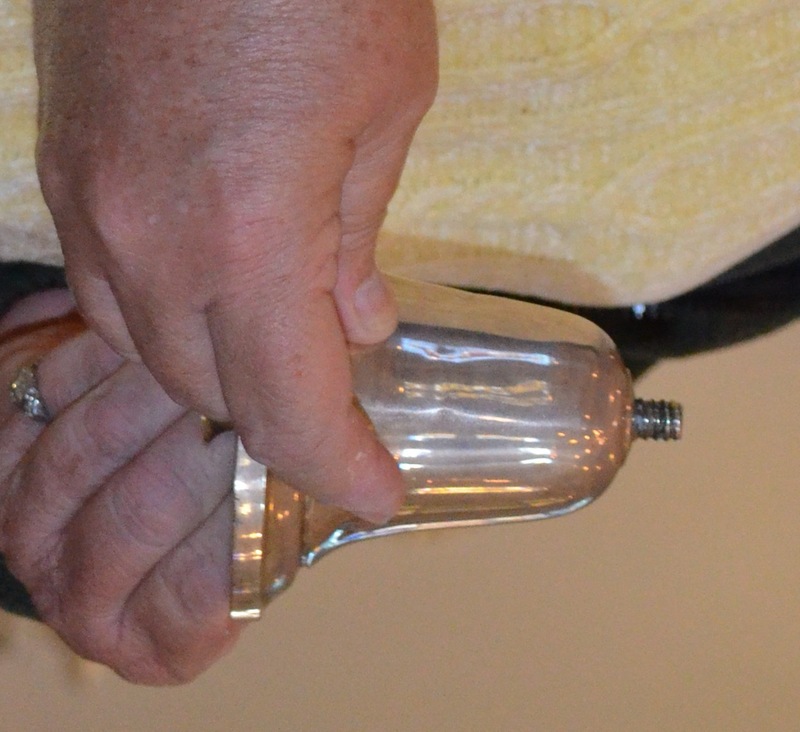 Miracles are associated with people praying and touching the vial that today holds the cross. The relic can be “proven” to the silver makers mark of 1633 in London. 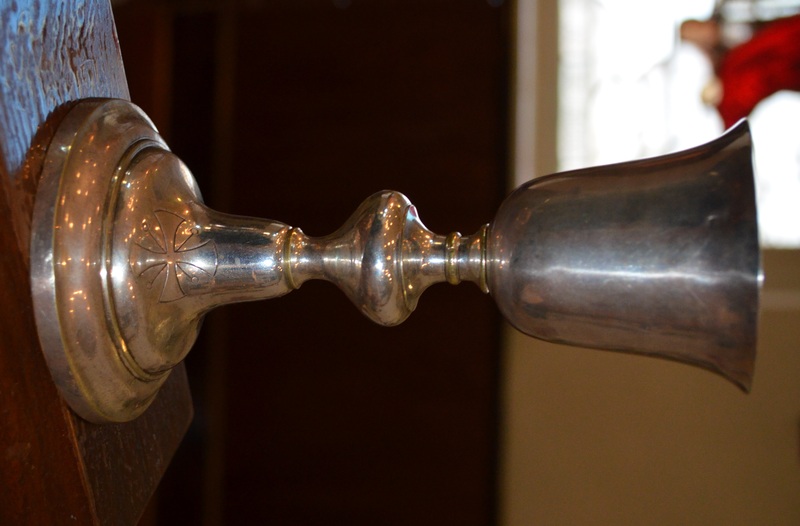 The silver “saddle chalice”, which can be taken apart and disguised as a bell, was used by the early Jesuit missionaries as they traveled the mission circuit. Sometimes Mass was said at the manor houses, not just at church. In fact the houses had everything they needed, except a priest and the chalice. This chalice was the one carried by the priest when he visited manor houses and from which he gave communion in the church as well. Thomas’s eldest son, John was an innkeeper at Port Tobacco. The inn was located beside and slightly behind Chimney House. John’s Inn was a neighbor to this home which still stands today. John would have visited Chimney House as well as been in the court house regularly. The court house stands adjacent to Chimney House today, but at that time, these buildings would have been part of a much larger “square” which historical records tell us included several inns, merchants, the court house of course, and homes of course of the “movers and shakers” of the day, who wanted to live close to the port and the court. Port Tobacco was designated as the county seat as early as 1686 and by then, John was already living there. A courthouse was built in 1730, telling us that prior to that, court was held in private residences, or perhaps, inns. The courthouse today is at least the third courthouse following replacements and fires. Chimney House, however, is original, and our ancestors surely gazed upon this house and trod its floors as we did today. Note the “Pent closets”, windows in the chimney, a feature exclusive to southern Maryland homes in this time period. The purpose is unclear. Thomas’s second son, Bowling, owned land in two locations, 6 or 7 miles apart, in Charles County, Maryland. You can see on the map below that these various locations were not far distant from each other. Because of the topography, there is no such thing as “as the crow flies”. Today’s major roads, 5 and 6, were both Indian trails. The Indians had identified the paths of least resistance, and fewest swamps, etc., and the English followed suit. B = Bowling’s land at Boarman’s Manor which included “Speaks Meadow.” This land is located 6.7 miles from point A. C = Port Tobacco which is where John Speak, brother of Bowling, was an Innkeeper and lived near the courthouse. This land is 12.1 miles from point B. D = St. Ignatious Church, the first Catholic Church where Thomas, the father of both Bowling and John would have been a member. This land is 3.6 miles from point C.
One group of tracts was in Boarman’s Manor at Bryantown and the second was adjacent Zachia Manor. Part of Bowling’s Zachia(h) Manor land is now occupied by St. Peter’s Church. In that timeframe, everyone named their land. Bowling’s land where the church is located was called “The Mistake,” a name which lends itself to sure and certain speculation. Bowling’s 220 acre Boarman’s Manor tract of land purchased in 1718 from Mary Gardiner is shown in the drawing below as parcels A (orange), B (green) and C (yellow). The deed of sale from Mary Gardiner to Bowling Speak described it as “being part of a greater tract of land commonly called or known by ye name of Bormans Reserve beginning at a bounded poplar of Williams Hardys Land.” Boarmans Reserve was later incorporated into Boarmans Manor, a tract that occupied approximately 4,000 acres. The 1797 patent of Cedar Grove, 537 acres, by Alexander McPherson is also shown on the drawing and includes a part of Bowling Speaks land identified below as parcel A and the uncolored parcels to the left and right. Speaks parcels B, C and D (blue) are not included in Cedar Grove. Cousin Jerry Draney found and mapped this land in anticipation of our 2011 visit. Today this land is located near Hunter Hill Place off of Bryantown Road. Speaks Meadow (17 acres), shown on the above drawing identified as parcel D (blue) was patented by Bowling Speak in 1739. It was described as adjoining to the upper end of Boarmans Manor beginning at a bounded white oak standing in the northwest line of said Manor. Jerry plotted this on a topo map, above, but here’s the same land using Bing, today. You can see the triangle shaped land characteristics and Leonardtown Road. Here, these tracts are overlayed on the map. In 1754 Bowling sold 60 acres, tract C, to Philip Edelen, who passed it to his son Richard Edelen. This parcel has not been found in the land records subsequent to this sale. The tracts in the drawing above colored orange, green and blue, were willed to Edward Speak by Bowling Speak in 1755. The will states “my dwelling plantation and a small tract of land called the Meadow.” Edward Speaks sold all the land and by 1779 it was all owned by the Edelen family. It’s believed that Bowling’s earliest land, that purchase in 1709 from the Mudd family was in fact a few miles up the road, located on what would become Boarman’s Manor, near Bryantown. In an attempt to better understand these locations and their proximity to each other, and to sort out confusion between the different tracts, I found the current location of St. Peter’s church and the location on Hunter Hill Place where we visited Bowling’s Bryantown lands. The church is the red arrow a the top and the Bryantown location is at the bottom. The map below shows the location of Bowling’s land, The Mistake, at St. Peter’s Church at the top, the location where the family group visited shown by the large arrow at the bottom and the triangle shape that encloses all of Bowling’s Boarman’s Manor land with small red arrows near the bottom. 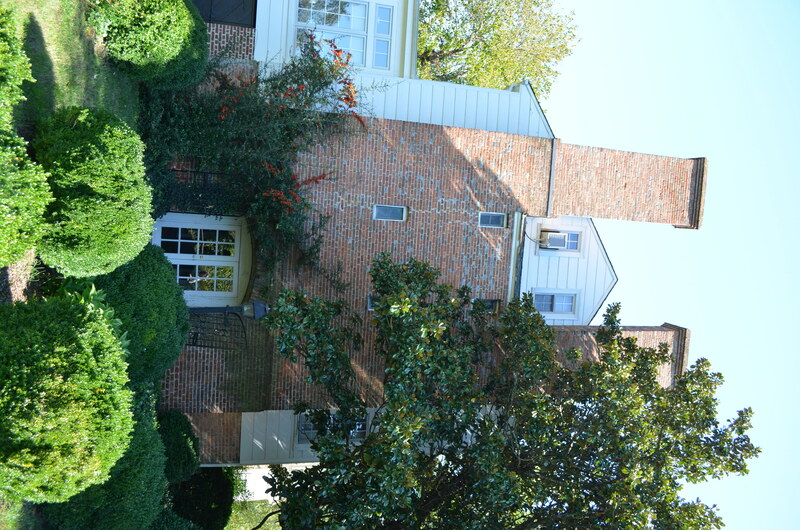 During the 2011 visit to Maryland, the family group visited the Boarman’s Manor lands owned by Bowling. Hunter Hill place, shown above, is a private road and the location of the large red arrow at the bottom of the maps shown above. It’s believed that Bowling’s Boarman Manor land is located here. Below are photographs of the area, left to right, forming a panorama. Below, the Speak(e)(s) family group in front of Bowling’s land. The Lord Proprietary against Bowlen Speak} The said Bowlen Speak being bound by Recognizance for his Appearance here this Court, to answer of and concerning a Pre-sentment by the Grand Jurors, for the Body of the Province of Maryland, against him found; for that he, on or about the first Day of March last, did, in a public Manner, drink the Pretenders Health, and good Success in his Proceedings; and being demanded whether he is guilty of the Premisses in the Presentment aforesaid mentioned, or not guilty, says he is guilty thereof, and submits to the Court’s Judgment thereon. The Pretender is of course, James, son of King James and his Catholic wife. England feared the return of Catholicism. Upon Bowling’s death in 1755, he left his “Mistake” and “Speake’s Enlargement” lands to his children. In his will, he gives the location of this land which Jerry Draney traced through deeds to the current owners, the Catholic Church. Bowling’s son, Thomas (known as Thomas of Zachiah), born about 1698, lived on this land. Later the same year, within a month of his father’s death, Thomas died as well, leaving his land to his children, but specifically to Charles Beckworth Speake and his brother, Nicholas Speaks. Charles Beckworth Speake was born in 1741 and his brother Nicholas, who shared the land with him, in 1734. To date, a sale of this land has never been found. To Thomas Speaks described as 121 acres of land being part of a tract of land called Mistake beginning at the first bound tree and running thence to Jordan Branch and up the said Branch to a swale next of his dwelling place and thence to the beginning to make out 121 acres tracts F and G in drawing below. Note: The first bound tree is located in the south east corner of the Mistake. Thomas Speak, Bowling’s son, also died in 1755 and willed his land to his children as well. Speaks Enlargement has not been found in Maryland land records so it is assumed that it was never recorded. To sons Thomas Bowling and John Speake “120 acres of land to begin at the second course or a line of a tract of land called Mistake and to run with the course of the land as they are laid out for me in the said tract of land called Mistake at the end of the course next to Jordan’s Swamp. To my loving wife Jane Speake my dwelling plantation whereon I now live during her natural life together with all that tract or parcel of land called Speake’s Enlargement. According to research by Joyce Candland there is no record that Charles Beckworth or Nicholas ever sold any land in Charles County. In 1779 William Speak sold 6.75 acres (tract E) to John Smith. The deed mentions the inclusion of dwellings, orchards and improvements indicating that William Speak must have lived on this land. William also sold tract D to Elizabeth Askin. Jerry plotted the Bowling land, “The Mistake”, on a map adjacent the land owned by the Catholic church. On the map you can see the current church and within the yellow boundary, the old cemetery. The land outlined in Green that intersects the land in yellow is land that Bowling lost in a resurvey. Today it is the “point” in the photo below. You can also see the high power lines that transect the land today. In the photos below, you can see the “point” in green which overlays the yellow. Jordan’s Run is right beyond the trees below, which are the trees at left, above. In 1673, Governor Charles Calvert moved his residence to “his Lordship’s Manor of Sachay (Zacchia)” for greater security and brought with him a Franciscan priest who established a mission, Lower Zacchia, which was the beginning of St. Peter’s neighboring parish, St. Mary’s or Bryantown. A short time later, the Franciscans built a second mission in Upper Zacchia, which is now known as Waldorf, but was then nothing more than a cabin, with the loft used to house passing missionaries. When the friar arrived, a bell was rung long and loud so that the Catholics for miles around could be notified of his presence. He would stay but a short time, hearing confessions, saying Mass and otherwise helping the parishioners any way he could. Marriages were performed, babies baptized and other sacraments administered according to the needs of the day. For the most part, until 1700, the mission church in Upper Zacchia was served by the Jesuits from St. Thomas Manor in Port Tobacco (St. Ignatius). In 1700, the log cabin was replaced by a church, probably a looking like an ordinary small frame house without a steeple to avoid the penalties places on Roman Catholic churches at that time. 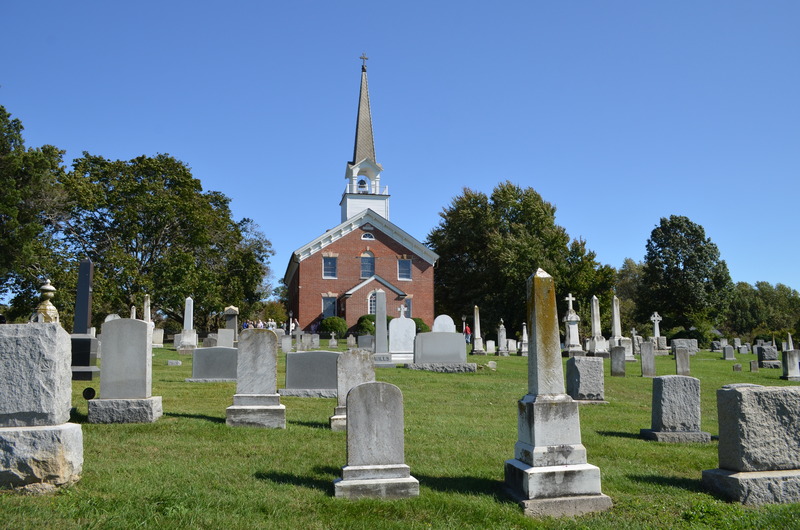 This church was located in the old cemetery about a mile east of the present church. 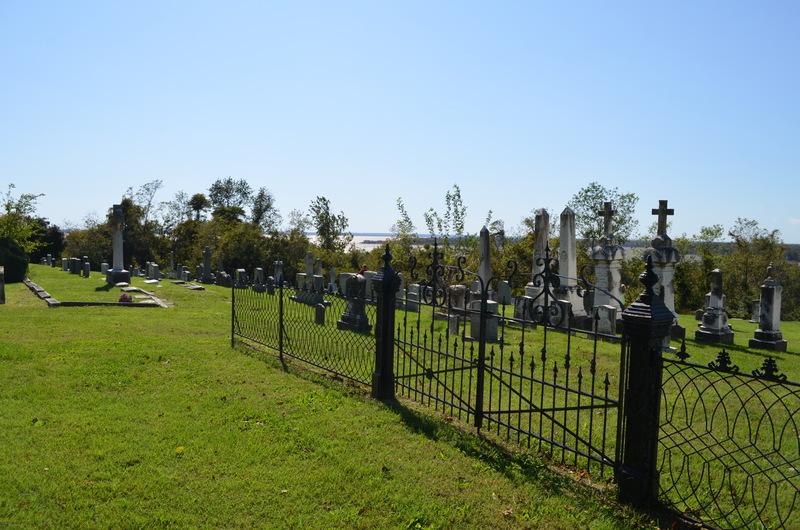 The location of this cemetery is right across the road from the church on Bowling (then Thomas of Zekiah’s) land. It’s not unlikely that the old cemetery contains a few, or perhaps more, burials of our families. More specifically, it’s very likely that Thomas, son of Bowling, is buried there along with his wife. Bowling may be buried here as well, especially given that both Bowling and his son Thomas died very near the same time. Both of their estates were probated at the same term of court in September 1755. 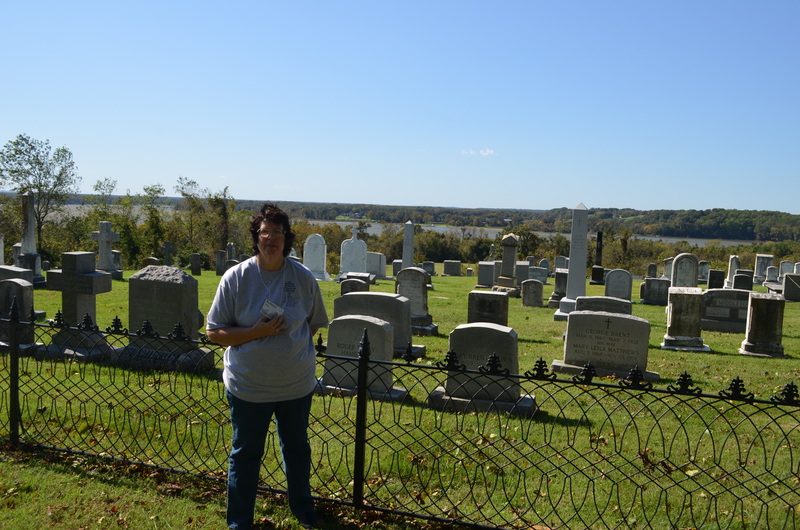 There are many unmarked graves in this old cemetery and the records have been destroyed. By the early 1800s a large portion of The Mistake was owned by Thomas C. Reeves. In 1767 Hezekiah Reeves, father of Thomas Reeves, purchased the 250 acre tract Bowling sold to John Lancaster and in 1801 (Tract B above). Hezekiah Reeves executed a gift deed giving to Thomas Reeves “that tract or parcel of land where he now dwells.” (Tract B above) The drawing below was obtained from St. Peters Catholic Church and shows the plat of a portion of the land willed to by Thomas C. Reeves to St. Peters in 1825. Notice that the plat shows 37 acres identified as The Mistake where the St. Peters Church is now located. The drawing below shows an overlay of the Bowling Speaks property on a current image from Google Earth. The names are the land owners as of the early 1800’s. I was confused as to why Bowling Speak would have had to, or chosen to, have his land resurveyed, especially given that he lost acreage in the deal. However, looking at this map, and who owned the neighboring land (Lord Baltimore), it now makes sense. A picture IS worth 1000 words. Zekiah Manor outlined in red as it existed in 1789, with the boot of Bowling Speake’s land that he lost in the resurvey shown over lapping. Thomas of Zachiah, in 1749, also apparently leased additional land. The entire survey of Zachiah Manor is shown, below. Zachia Manor abutted the Speak property, and we find that lot 68 is on the northern boundary, shown occupied in 1789 by a man named Baggett. In an article about the Alvin family, we discover some interesting information about the lands of Zachia Manor, which would certainly extend to the Speak lands as well, abutting the Zachia Manor lands. Therefore tenants in Zachia Manor tended to be relatively poor. We know that Mr. Key did negotiate a lease on a certain Lott No. 34 of Zachiah Manor in Charles County from the proprietor, Lord Baltimore, and that the lease began on Christmas Day, 1750. The annual rent was set at ₤1 and 10 shillings per year, and the term was to extend over the life of his youngest son, Francis Key, who was Clerk of Cecil County. Lord Baltimore allowed leases on his manor lands to be set for a term extending over the lifetime of up to three persons designated by the lessee, or over a set number of years. After the Revolutionary War, the land would have been sold as Lord Proproprietors were no longer needed. This survey was for the sale of the tracts that Lord Baltimore had been leasing previously. Bowling was assuredly a Catholic, and one could safely presume his children were as well. 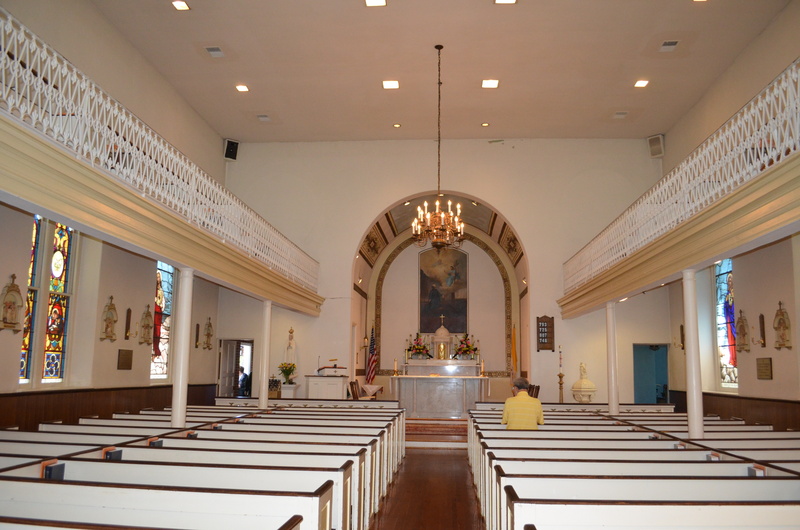 All of them probably baptized in St. Ignatius Church in Port Tobacco. It’s unlikely that all of the children born to Thomas, Bowling or Thomas (of Zekiah) survived. Those children were probably buried, after being baptized, if possible, either in the family cemetery, now lost, or in the St. Ignatius churchyard, whose early records are also lost. After 1700, they could have been buried in the old church cemetery on Bowlings and then Thomas’s land. Charles Beckworth Speake lived with his father, Thomas, on Zekiah Manor from his birth in about 1741, inheriting land in 1755 at his father’s death, until he moved to Rowan/Iredell County, NC. He was on the Rowan County tax lists by 1787 and had died by 1793, leaving young orphans. Apparently his wife had died too, as the children were made wards of a Richard Speak. Nicholas, the son of Charles Beckworth Speake, reported being born in Maryland in 1782, so apparently Charles Beckwith Speak(e)(s) moved to NC between 1782 and 1787. Charles Beckworth was probably born Catholic in Maryland, but may have switched to the “church of opportunity” after leaving Maryland. 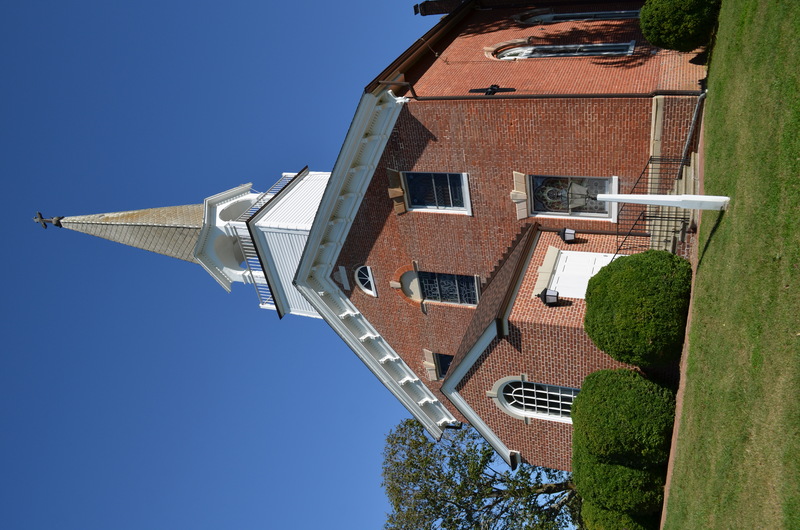 Charles’ son, Nicholas, as we know was a Methodist minister, never wavering from his path, establishing Speaks Methodist Church in Lee County, Virginia in the 1820s, near 1830. Back in Maryland, we can rest assured that indeed, the two churches, St. Ignatius and St. Peters served the needs of at least the first 3 if not 4 or 5 generations of our Speak(e)(s) ancestors in Charles County, Maryland. 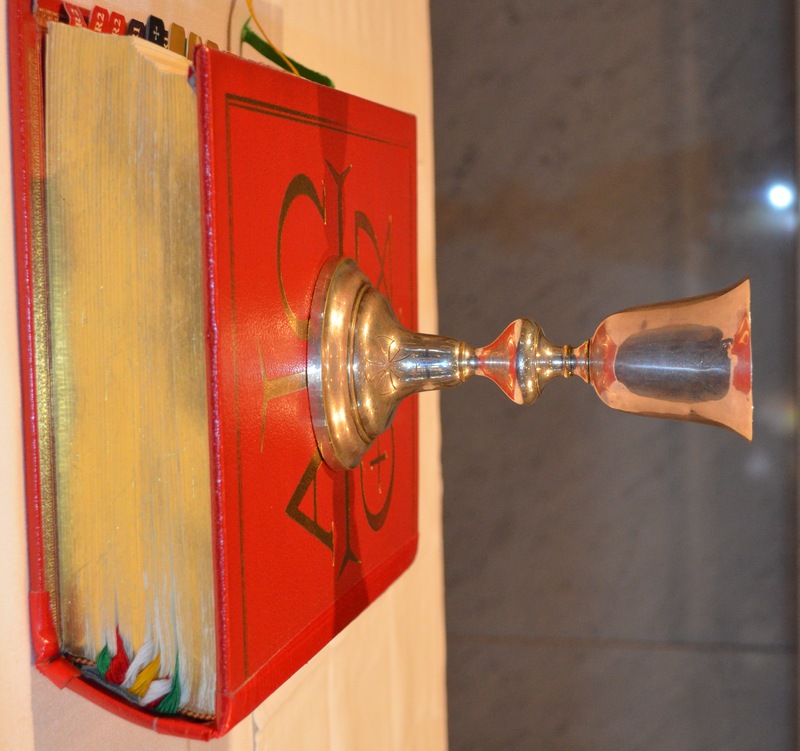 In the photo above, I am holding both the “relic of the true cross” and the chalice. Both of these items were assuredly near and dear to the hearts of Thomas, the immigrant, and his wife, Elizabeth Bowling who, along with her brother James, were assuredly Catholic. Their sons would also have taken communion from this chalice, Bowling and John. Bowling was a practicing Catholic, so we can presume his wife Mary Benson was as well. Their sons would also have been baptized Catholic, which included Thomas of Zekiah who died in 1755. Thomas’s wife, Jane was probably Catholic as well, but it’s about this time that we can no longer tell for sure. It’s likely that Thomas remained Catholic and that his son Charles Beckworth Speak was as well. Charles moved to North Carolina and died while his children were yet young, in 1793 or 1794. By 1820, Charles’ son, Nicholas was a devout Methodist. If Charles was still a practicing Catholic, then Nicholas would have been initially baptized Catholic, probably in St. Peter’s Church, when he was born in Maryland in 1782. I am a 10th generation descendant of Thomas, the immigrant, and Elizabeth Bowling Speak. I’m sure that Thomas and Elizabeth never dreamed that 355 years later, their great-great-great-great-great-great-great-great-granddaughter (yes, that’s 8 greats) would come back to Maryland, from someplace that at that time had no name (Michigan) and had not yet even been “discovered,” in one days time, in an incredible metal carriage with no horse, on roads with hard surfaces, at unbelievable speeds, to stand where he worshiped, to hold the chalice he drank from and the relic he prayed with. Perhaps he prayed for the life of my ancestor or his other children. Perhaps he prayed not to be forgotten, and perhaps, just perhaps, his prayers were answered. Several Speaks men have tested who descend, or thought they descended from Thomas Speak. You might notice on the chart above, that not all of the “sons” are yellow, the color of John, Bowling and Thomas. In fact, Capt. Francis and William are blue and red, and John E. is both green and yellow striped. This means that the descendants who tested in these lines do not match. Whether that is actually because Francis, for example, really was not the son of Richard, or whether an undocumented adoption has occurred some place in the line or the genealogy is incorrect has yet to be determined. In order to further define those lines, we need additional men from those lines to test. John, on the other hand was schizophrenically colored with yellow and green stripes because his two sons lines DNA did not match. However, we know that the Thomas line is yellow because people from various sons lines all matches the yellow DNA results. The Charles Beckworth to Nicholas Speaks line is the yellow line to the far right, above. Based on this information and the combined DNA results of his descendants, we know that Thomas the immigrant was “yellow” because that DNA is found identically in both of his sons lines and from this, we have been able to reconstruct Thomas’s marker values. It’s really kind of amazing, to be able to reconstruct part of the DNA sequence of a man who died 333 years ago, and all without a shovel! The chart above shows that these four individuals all descend from Thomas, 2 through son Bowling, and 2 through son John. All 4 of these men match exactly on all of the markers shown. Therefore, we know that Thomas, the immigrant carried these exact same marker values. This process is called triangulation, and it’s how we “reconstruct” the DNA of an ancestor by utilizing the DNA of his descendants, preferably through multiple sons. It would be the Y DNA of Thomas’s descendants that would match the Lancashire DNA and would, in 2013, guide us home, back across the sea, tracing Thomas’s footsteps, in reverse. What would he think? The story isn’t finished. Check back for articles in the 52 Ancestors series and the 2013 DNA Trip series as well. Jim and I were looking at that very same picture of St. Mary’s last night. I have two relatives that are Bowlings. My sister-in-law Kathy Bowling (Lamm) who lives in Maryland and her daughter-in-law, Teresa Bowling (Lamm) lives in Florida and I didn’t evern know that . One of Kathy’s relatives did do his DNA but I realize that you are interested in Speaks line but I found this very interesting. Didn’t know about the Bowling name being in there for the Lamm relative in Florida. I find your story so very interesting. I too am a tenth generation descendant of Thomas’. John Speak had a daughter, Priscilla, who was born in 1767 and she would be my great great great grandmother. Fascinating, I believe that John Speak is my 10X Grandfather. Hello cousin! Indeed, it looks like you do descend from Thomas. If you’re interested in DNA testing, please test at Family Tree DNA and join our DNA project. You may also want to check out the Speaks Family Association at https://speakfamily.wordpress.com/. From there it goes to the Miles/Wethington family down to the Stinnett family. If you have taken the Family Finder year at Family Tree DNA, you are most welcome to join the Speak project. George Speake his son ~1760-1828 This generation started moving west. Benjamin Speake his son 1799-1880 Started his family in Kentucky and finished in Missouri. I have my dad’s DNA—would that be helpful for your project? If your Dad has taken the Family Finder test, it would be wonderful if he would join the Speak project. Always nice to meet a new cousin! I am also a descendent of Joseph Bolton and Margaret Clarkson/Claxton.My GGG Grandpa was Dalsey Edgar Bolton who married Elizabeth Estep! I’ve just started to research the Speake family, they are fascinating. Have you DNA tested yet? If so, where? I only recently discovered that I descend from Mary Speake, sister of Thomas Speake of St. Mary’s. Mary married James Bouring (Boren) who was the executor of the estate of Thomas Speake. Thomas Speake and James Boren came together from Stafford County, Virginia, where they had been part of the original patentees from 1651-1666 of Mason Neck (Gunston Hall Plantation owned by George Mason). Great family heritage.